Display favorite family photo frames or canvas art in style with this white decorative picture ledge floating wall shelf. A sleek edge on the front of this decorative shelf is designed specifically to support picture frames. 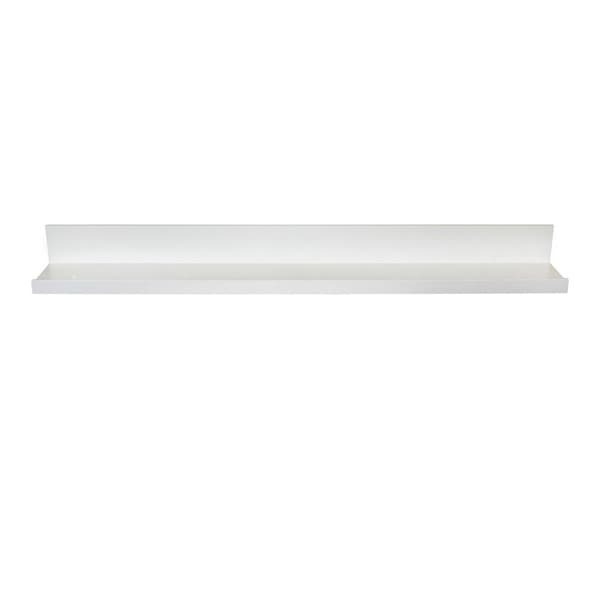 This handsome white decorative shelf will look great in any room of your home. Installation tip 1: for a sturdy installation, install at least one side of the wall shelf into a wall stud, as shown in the instructions. Installation tip 2: use the drywall anchor installation method to mount the shelf if you cannot locate a wall stud. Installation tip 3: make sure the arrow on the hidden metal bracket is pointing up. Durable MDF construction meets new CARB standards. Dimensions: 3.5 inches high x 35.4 inches wide x 4.5 inches deep. We installed the picture ledge in the bathroom. It was easy to install and is very sturdy and looks to be made of good quality. 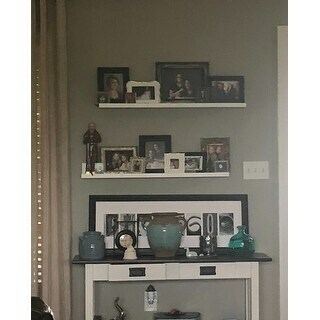 Nice basic picture shelf for a very reasonable price. Only deducted one star because the instructions could have been a little bit clearer, and the wall anchors didn't work very well. But it's not going to bear a ton of weight, so it's fine. Nice shelf. Goes up easily. My husband had a bit of a heart attack having to put "holes this big" in the wall but it's for good reason. My tchotchkes are safe. Would recommend. Great price. Very easy to attach to the wall and looks exactly as described. They were quite a bit heavier than I was imagining, in a good way. We did a mix of studs and drywall attachments to put these up in our living room and they turned out great! Excellent. Easy to install and sturdy. Clear directions. SLooks great, no product issue. Shipped quickly and great price. Holds shot glasses perfectly. Great looking shelf but to slim for what I was expecting to use them for. Ended up hanging them in my daughter’s room. This is perfect on my wall to display all my travel photos! This brand is the very best. I would highly recommend Lewis Hyman's shelves in any size you need! I am obsessed with these. I put three on a wall in my guest room for books and they look amazing. I would definitely buy again. Very clean, easy to put up. Doesn’t look or feel cheap.